I honestly don’t think that there has been a rum – or any product for that matter – that I have had more people ask me for my opinion on in hushed tones than Ron de Jeremy. With those points in mind, I’ll confess that my initial reaction to hearing about the rum, other than a chuckle, was that I wanted nothing to do with it. Still, I couldn’t really not wonder what the rum would be like. According to the marketing glitz, the actual rum was developed by the same people who worked on Ron Abuelo – whose 7 Años is a rum I quite like. Suddenly I was conflicted, and like the many people who approached me, I felt curious and a little dirty in wanting to know more about Ron de Jeremy. Somehow I think that’s exactly the way they want it. Ron de Jeremy (a clever play on the fact that rum in Spanish is ron – which is why so many rums are name Ron Something) is a molasses-based rum that is distilled in Panama. It is then aged for 7 years in oak barrels before being bottled at 40% ABV (80 proof) and festooned with enough innuendo to kill a teenaged boy on-sight.. The Jeremy is a golden amber color in the bottle and in the glass. After the usual pour and swirl the legs reveal themselves to be incredibly thick and heavy, taking a long time to work their way to the bottom of the glass. At the outset the nose of the rum is all caramel and honey. Behind the sweet notes are some hints of green apple and leather, which are both subsumed under a heavy dose of vanilla. There’s still a hint of an ethanol at the back-end, but it’s not overpowering. The sweet beginning to the nose is reflected immediately on the palate. 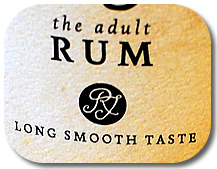 The entry to the rum is very sweet – almost syrupy – with flavors of vanilla and caramel. Your tongue is immediately coated in a rum that is heavy and viscous, eventually giving way to a midpalate of banana, almonds, and honey. As the rum slides down your throat you find a touch of heat at the finish. A bit of the sweetness lingers, but the finish of the rum leaves you feeling as though you just smoked a big cigar. In fact the sudden dry, smoky finish appears out of nowhere before completely drying out your palate and making you wonder where it came from when the rum started so strong and sweet. The disjointed flavors leave you feeling like you started with one rum in your mouth but finished with another. A light dollop of simple syrup and three dashes of bitters with the Jeremy makes a pretty good Rum Old Fashioned. The bitters and sugar provide a nice bridge between the entry and finish of the rum and tie in very nicely with those tobacco notes on the end. It also plays well with dry vermouth, so drinks like the El Presidente or the Palmetto are other good choices – provided you go a little heavier on the rum than on the vermouth (oddly enough the Ron de Jeremy doesn’t stand tall in a drink, and instead just lies down for the other ingredients). Tiki-wise, you would do well to use it in the slots allotted to gold Puerto Rican rums in any Don The Beachcomber recipe. Wow, never has that heading seemed so dirty. The Ron de Jeremy sounds like it could be the greatest (or worst) practical joke ever, but is a rum that I could see a lot of people enjoying. Personally, I find that it is a touch too sweet for my tastes at the outset and while I do enjoy notes of tobacco and grass in my rums, the disconnect between entry, midpalate, and finish on this particular rum is bothersome to me. Really what I want is for this to be two rums rather than a rum that feels like it’s trying to be two things at once. Let’s try this again. We too reviewed a pre-release bottle of RdJ provided by One Eyed Spirits. At that time we found it hot – hot – hot, an near jalapeno finish, jolting and uneven. We were in contact with OES at that time and suggested he consider a reformulation. Then I read your review, and had to wonder whether indeed there has been a reformulation. As most know by now, RdJ was heavily promoted on the basis of being produced by Abuelo, along with Zaphra 21. The distiller’s dilemma is this – does he really want to produce a rum that will be better, and better reviewed than his own, well established products?